Because the 7950B is not strictly a new SKU, and because the performance of the 7950B isn’t very far ahead of the 7950, we’re going to keep our look at the 7950B’s performance relatively short. As always, if you want a complete breakdown of performance please see Bench, which has our complete results for the 7950B and over two dozen other cards. Kicking things off, we wanted to start with a quick look at clockspeeds. Unfortunately AMD still hasn’t come through on their promise to expose the precise clockspeeds of their Southern Islands cards, which means we’re stuck looking at clockspeeds in a halfway blind manner. We cannot tell when PowerTune throttling has kicked in to push clockspeeds below 850MHz, and at the other end of the spectrum we cannot tell what PT Boost is doing when it’s boosting. As a result we can only see two card states, the base state of 850MHz when the 7950B is operating at or below 850MHz, and the PT Boost state of 925MHz when the 7950B is operating at between 851MHz and 925MHz. Still, this is just enough information to piece something together. 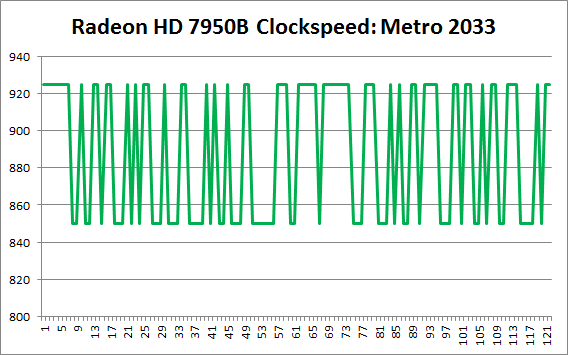 The above is a graph of clockspeeds when running Metro 2033 at 1920x1200, and it’s virtually identical to what we see with other games. The 7950B fluctuates wildly between its base state and its boost state. This is not the kind of behavior we see from the 7970GE or for that matter NVIDIA’s GTX 600 cards. This fluctuating behavior is unique to the 7950B. So what’s going on? As near as we can tell, the power requirements for boosting are so high that the 7950B simply cannot maintain that boost for any significant period of time. 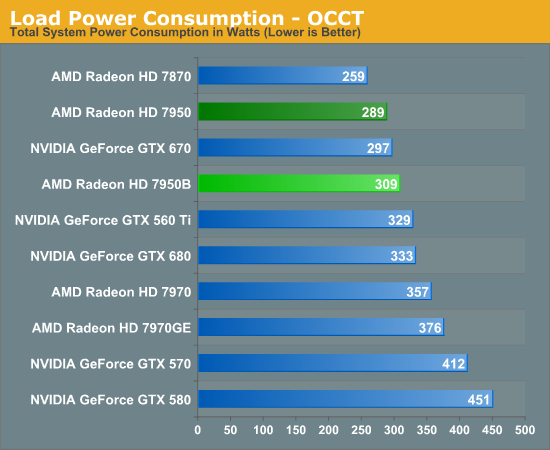 Almost as soon as the 7950B boosts needs to go back to its base state in order to keep power consumption in check. The culprit here appears to be the 7950B’s very high boost voltage of 1.25v, which at 0.125v over the card’s base voltage makes the boost state very expensive from a power standpoint. 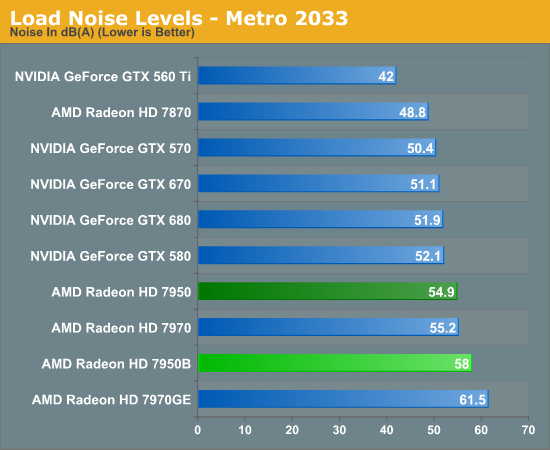 If our theory is correct then this means that the 7950B never gets very far past its base clockspeed, and compared to the 7970GE, PT Boost is almost entirely wasted here. Looking at our performance charts, what we’re seeing would seem to confirm our theory. Keeping in mind that the base clockspeed of the 7950B is 6.25% higher than the 7950, the only time we see a significant jump in performance beyond that is with Civilization 5, where performance increases by 9%. 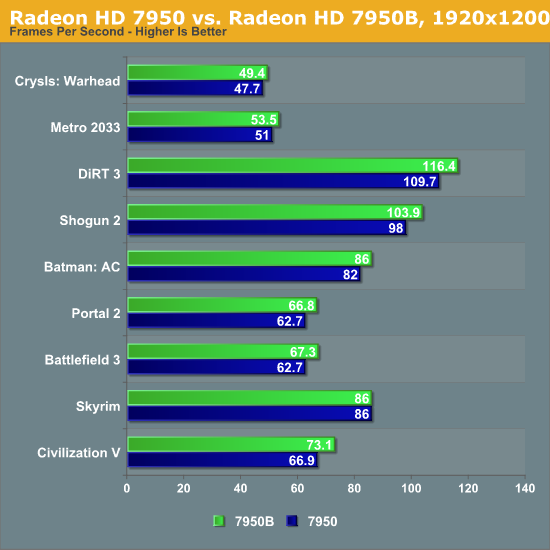 Otherwise performance increases by merely 4% in Crysis, up to 7% in Battlefield 3. 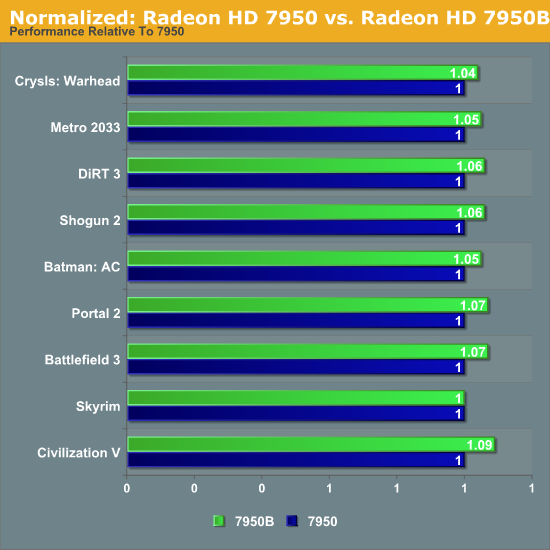 Not counting Skyrim (which is CPU limited), we’re looking at an average performance gain of just over 6%, which is very close to the increase in the base clockspeed relative to the 7950. As we’ve stated before this is free performance and we’re happy to take it, but at the end of the day 6% is not nearly enough to matter with the current competition. 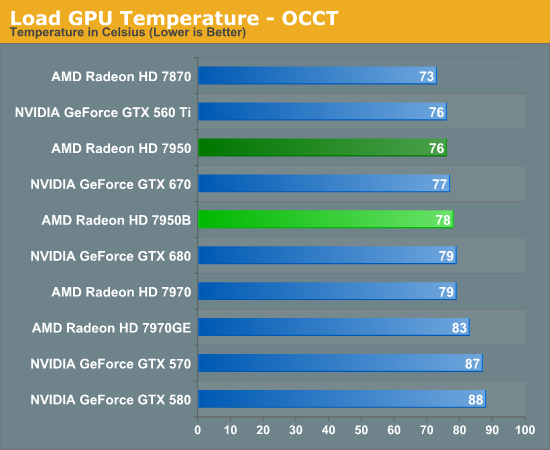 Until such a time where the competitive landscape changes, the 7950 will continue to be well behind its next-closest competitor, GTX 670. Bringing things to a close, we quickly wanted to break out power, temperature, and noise. As we’ve stated earlier, AMD is making a clear set of tradeoffs with the 7970GE and 7950B, forgoing power efficiency in the name of performance. We’ve seen the 6% performance boost the 7950B offers, but what exactly has the cost been? Starting as always with load power, we see that relative to the 7950, the 7950B’s power consumption at the wall is 20W higher in both tests. This fits well with AMD’s official specs, which have the TDP of the 7950B at 225W, versus 200W for the 7950. 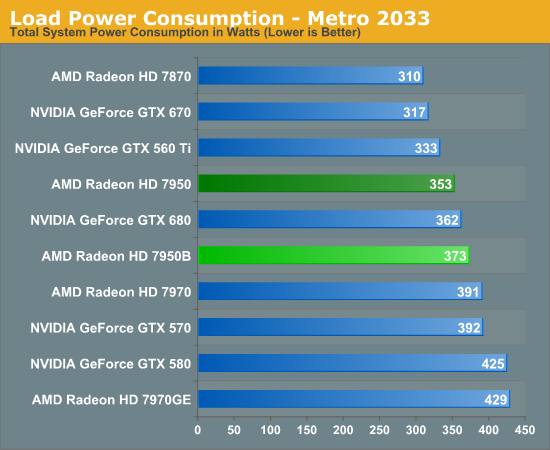 As a result of this power increase the 7950B draws more power than even the GTX 680 when it comes to Metro, though thanks to AMD’s more rigorous throttling their power consumption still comes in below the GTX 680 under OCCT. Moving on to load temperatures, it comes as no great surprise that with an increase in power consumption comes an increase in load temperatures. 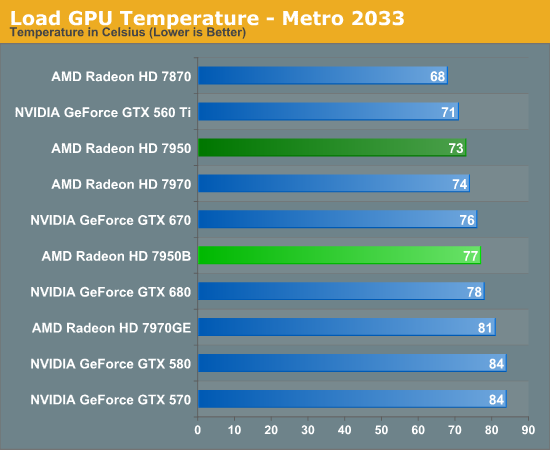 The 7950B still fares well here, staying below 80C in both tests, but the 4C jump in Metro is a bit more than we would have expected for only a 20W increase in power consumption. Last but not least we have our look at noise under load. Unfortunately the 7950B looks especially bad here, thanks to the more aggressive fan curve we typically see on 7950 cards. 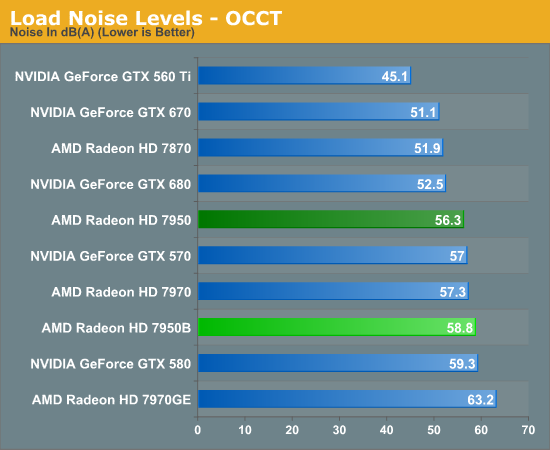 With both Metro and OCCT the 7950B is pushing 58dbA+, which is louder than even the better performing 7970. In fact all things considered this is quite a ridiculous amount of noise, the same problem the 7970GE had. The good news is that the reference 7950 is rarely sold these days, but we have every reason to believe that aftermarket cards will see a similar jump in noise. There’s no getting around the fact that 225W is a lot of heat to dissipate, especially for designs that weren’t necessarily optimized around that level. Wrapping things up, it’s difficult to hold a favorable opinion of the 7950B given what we’ve seen so far. AMD may be putting all of their focus into performance-per-dollar, but that doesn’t mean that performance-per-watt has suddenly stopped mattering. The 7950B’s performance boost is free from a price perspective, but the tradeoff that comes with it is anything but. A 6% jump performance for a 10% increase in power consumption and notable rise in load noise will certainly be acceptable to some users, but it’s difficult to argue that this is a good tradeoff overall.